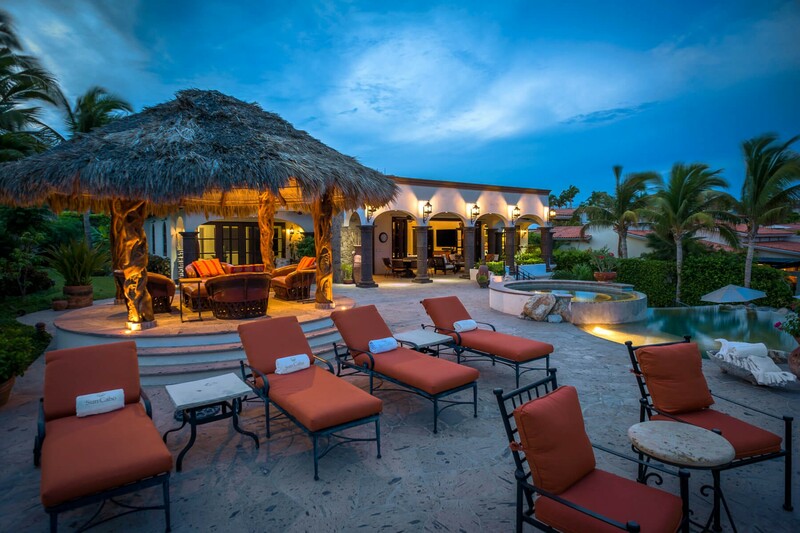 Nestled overlooking the dazzling waters of the Cortez in Los Cabos, Mexico, you will discover the luxurious 5-bedroom villa, Casa Alegria. 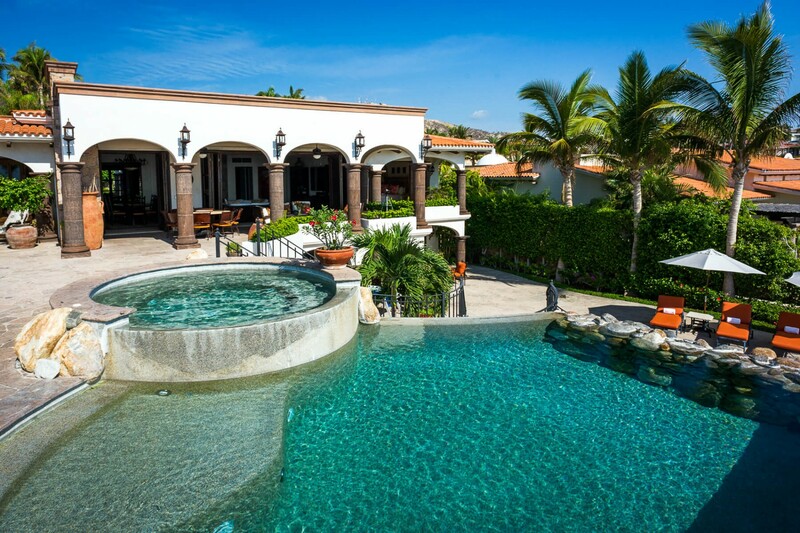 The property is part of the elegant and sought after Palmilla Resort and hotel. 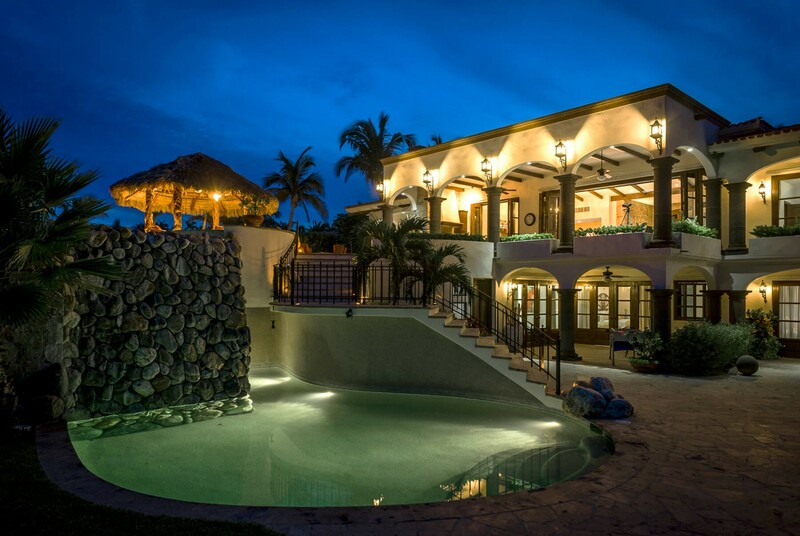 Based specifically in the ultra-exclusive Caleta community, this gated area provides an abundance of privacy and seclusion from the outside world. 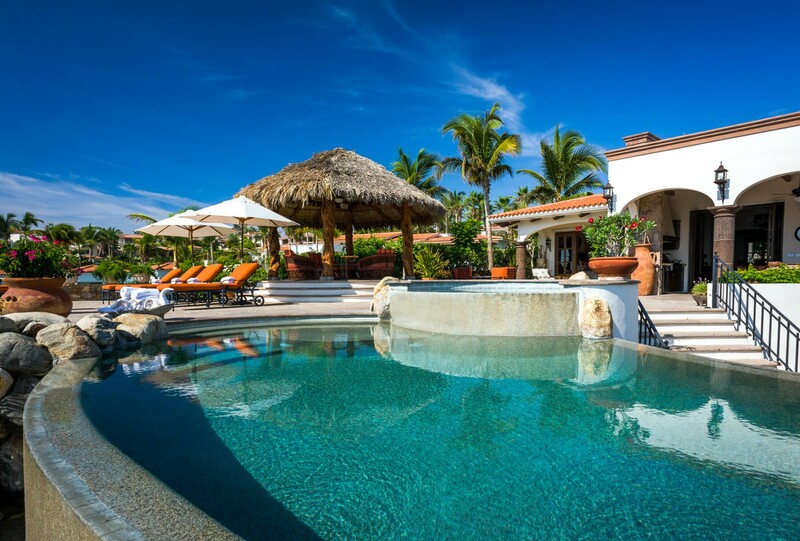 Casa Alegria enjoys complete serenity overlooking the endless turquoise waters and yet also offers access to some of the nearby resort’s amenities and key features, including the Palmilla Golf and Tennis clubs. 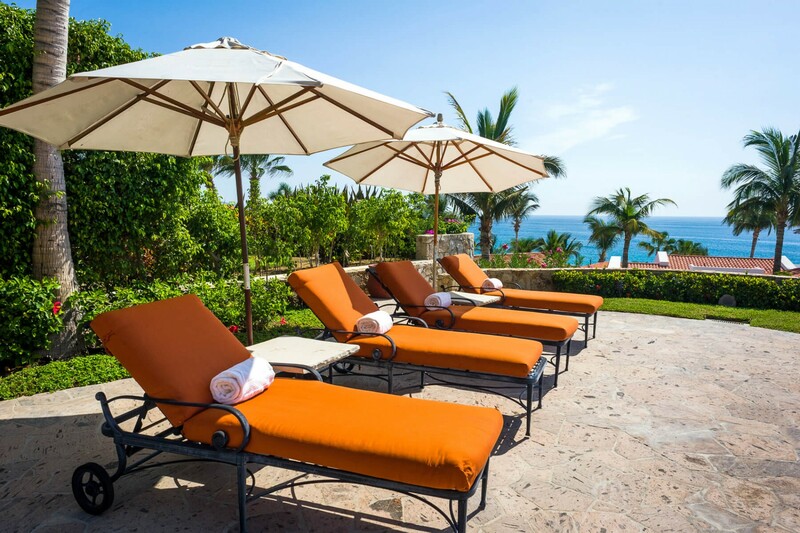 Indulge in panoramic views and landscaped surroundings as you indulge in a vibrant, Mexican vacation. 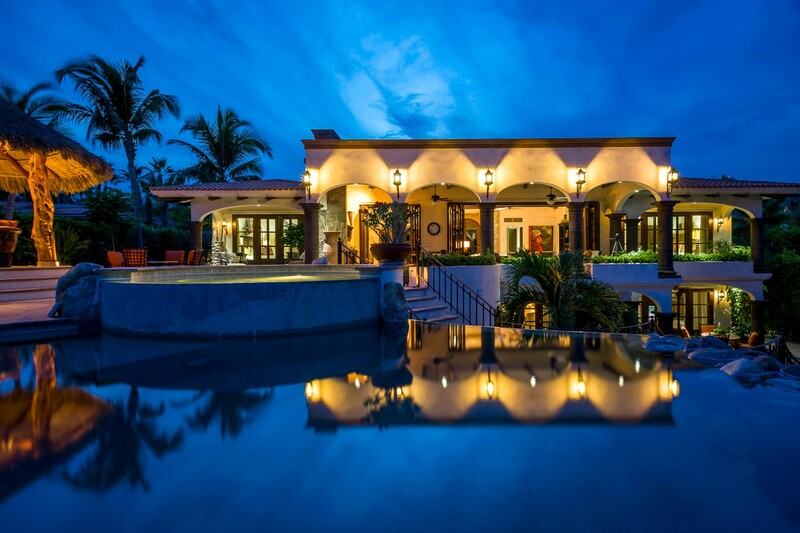 This modern property includes an idyllic blend of Spanish Colonial hacienda and Tuscan styled interiors. 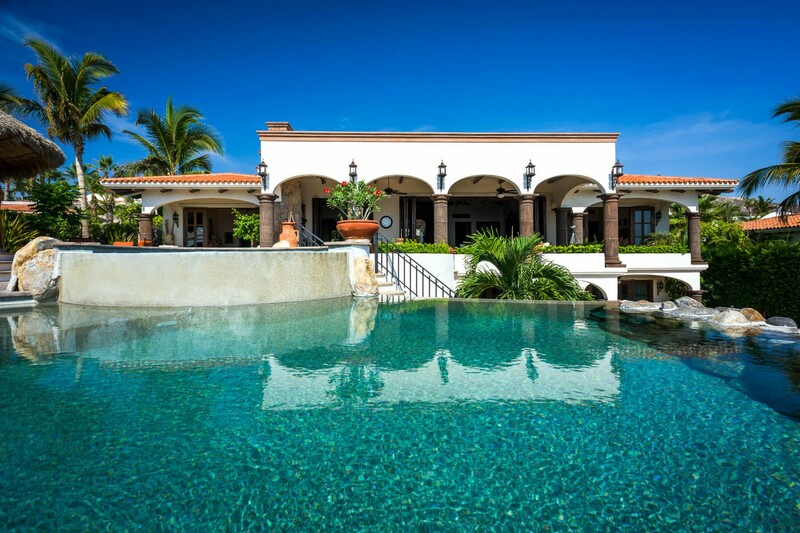 The villa can accommodate up to fourteen guests over the lavish interiors and expansive exteriors. In total, the villa enjoys 8,758 Sq. Ft. of living space. The main living area is located on the second floor and features high-vaulted ceilings and large sliding doors. 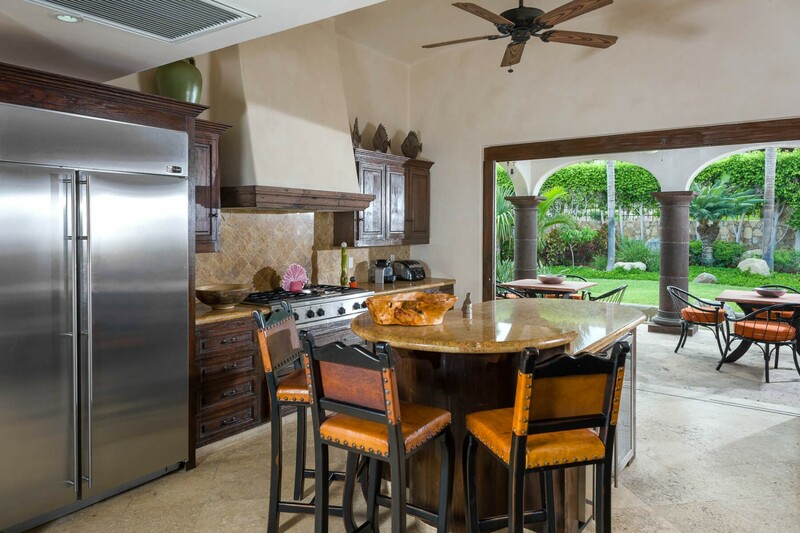 This open plan space includes the living and dining area with access to the fully equipped kitchen. The room seamlessly opens out onto the terrace, flooding the space with light. 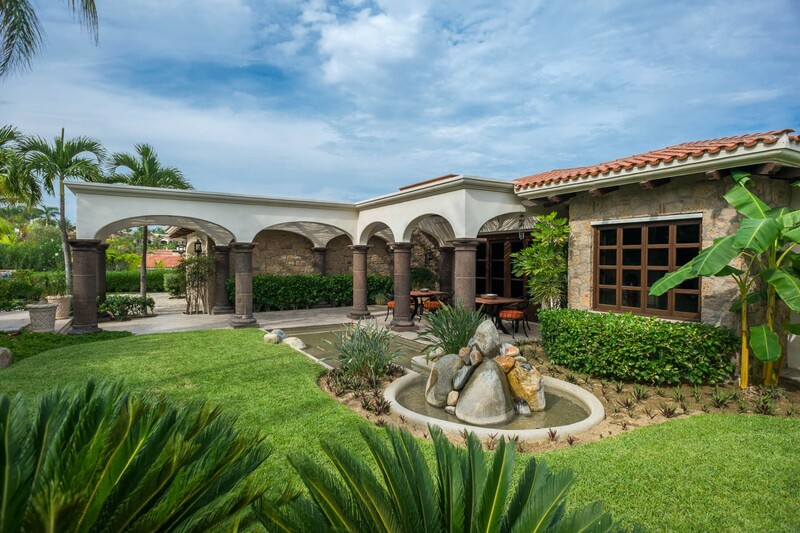 Laced in Alegria features such as the large palatial columns, exquisite stonework, and beautiful wood accents, the villa creates an elegant and unique ambiance throughout. The living area includes an ultra large 80" Flat screen TV with surround sound. 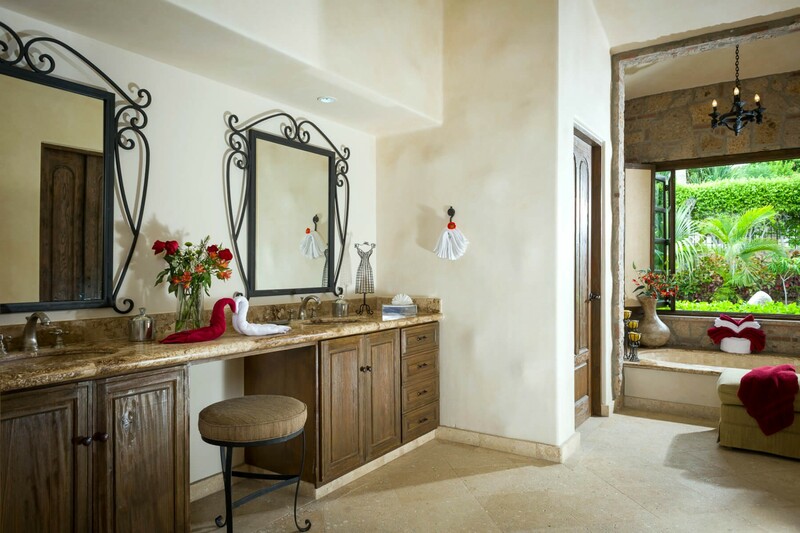 The interiors of the villa include high-speed cable internet with Wi-Fi. 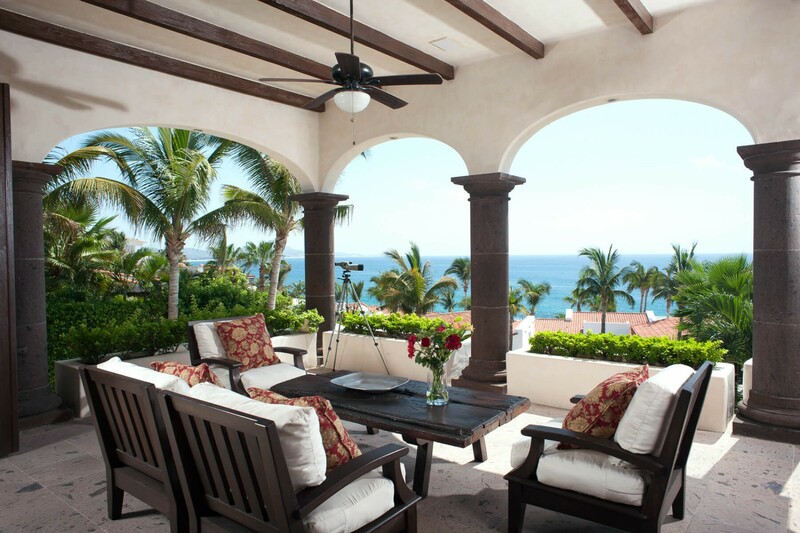 The covered second-level terrace enjoys comfortable outdoor seating and access to the private swimming pool. 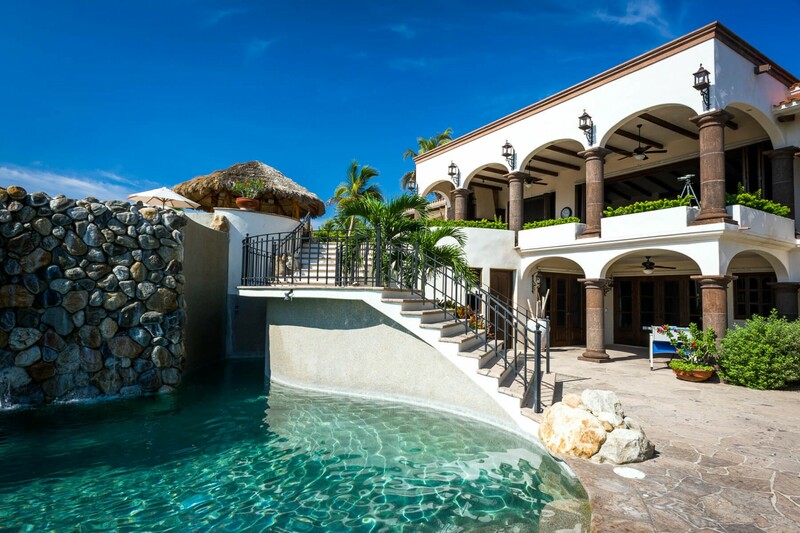 This incredible tiered pool is connected by a large river rock waterfall. 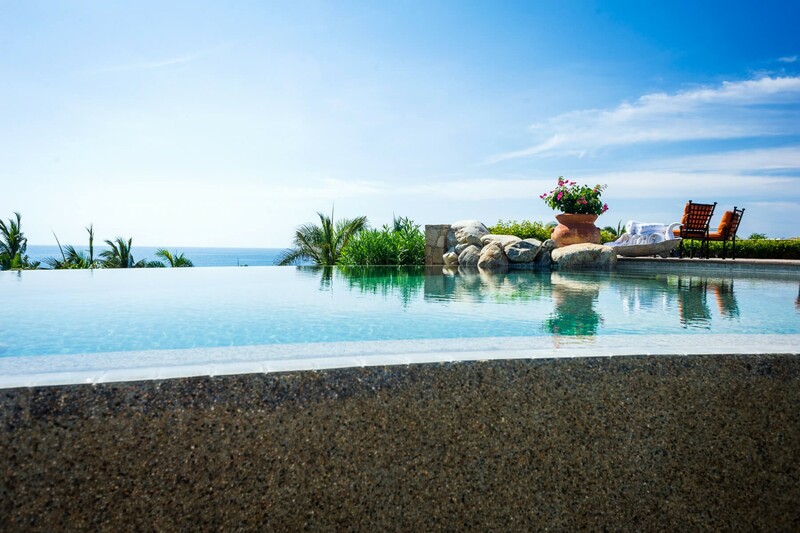 The pool has the additional feature of heating, if desired, so slip into the silk-like waters at any time of the season. Soak in the breathtaking views as you swim a few laps in the elevated pool or delve into the elevated, bubbly waters of the private jacuzzi. This beautiful Cantera-tiled patio is laced in sun loungers, perfect to enjoy the sun-kissed location. In the evenings you can spark up the barbeque for some smoky treats and dine alfresco under the stars. 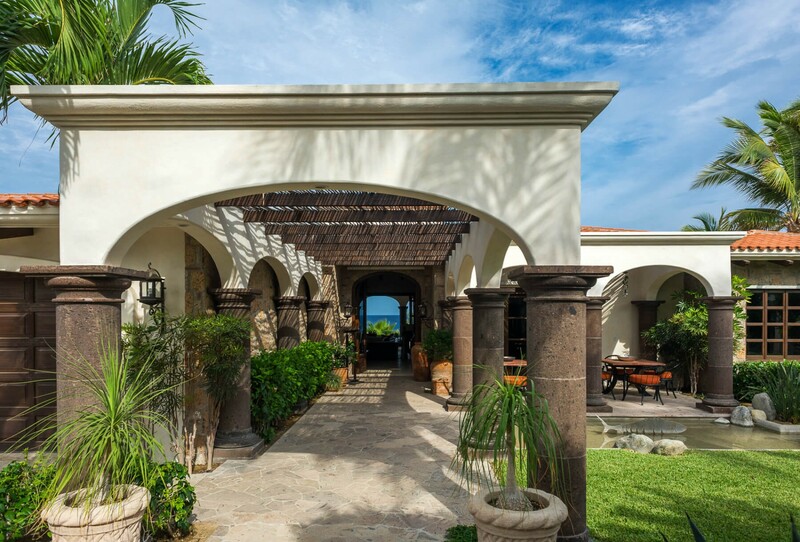 Enjoy a delicious glass of wine under the covered gazebo as the evening draws to an end or make your way onto the elevated balcony to bask in the views over the Cortez. 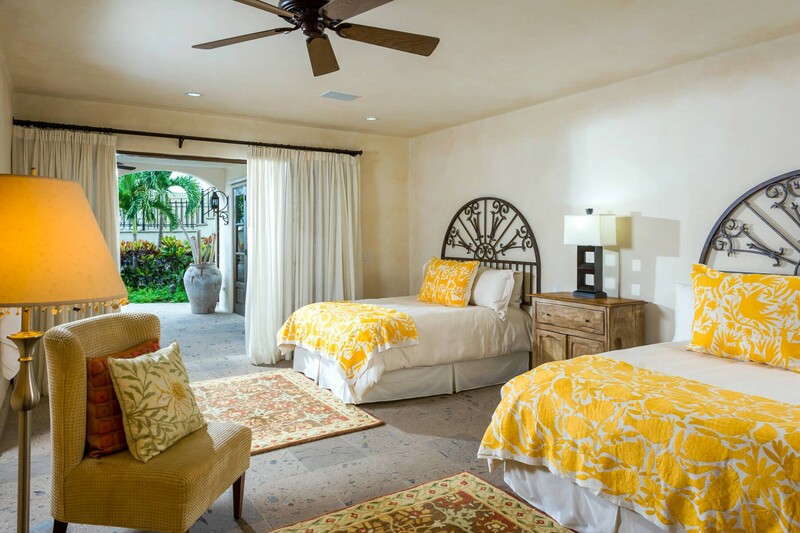 The villas lavish bedrooms are based on the ground floor and open out onto the lower offering direct access to the pool and landscaped gardens. 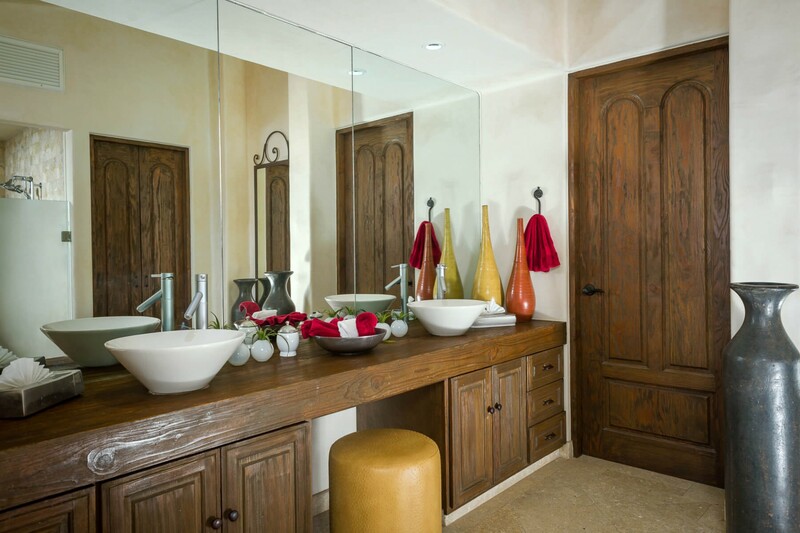 Casa Alegria indulges in five luxurious bedrooms, each boasting their own private en-suite bathroom. 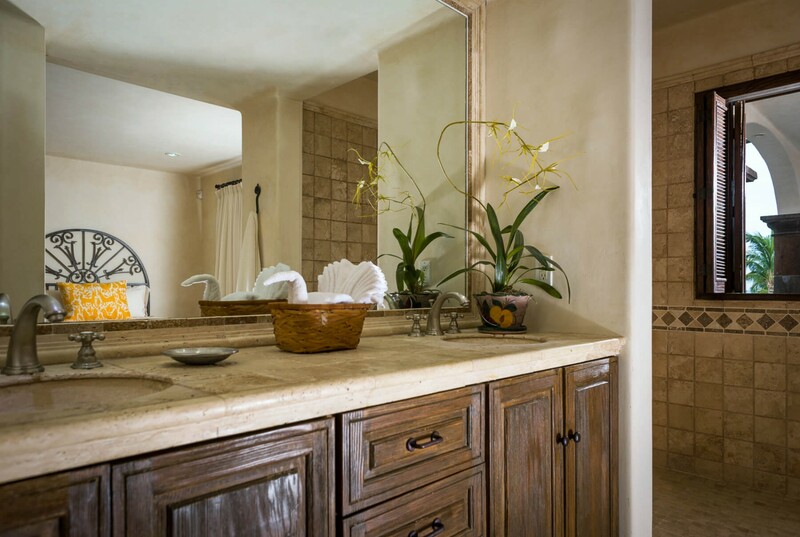 The bedrooms each feature lavish linens, fresh towels, hairdryers, and stereo systems. 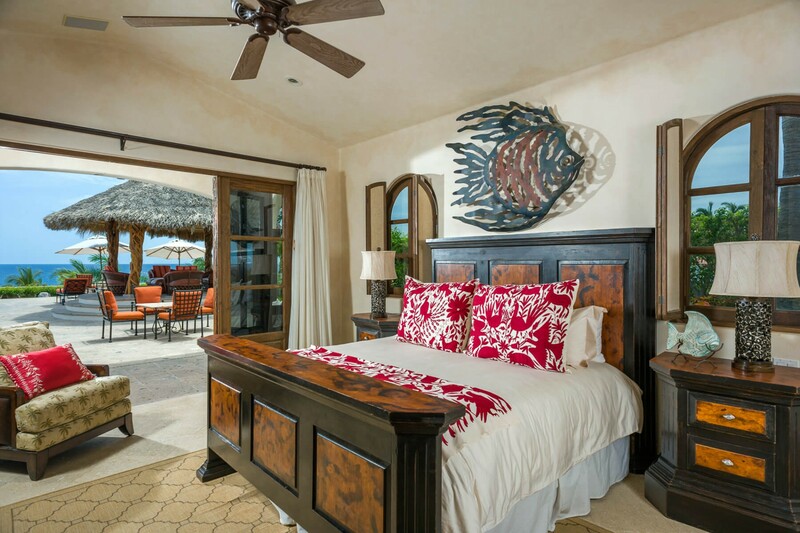 The master suite is based on the ground floor and enjoys access onto the lower terrace and pool, which soak in panoramic ocean views. The interiors offer a large King-sized Bed, high-resolution TV, DVD Player, and an in-room safe. The private en-suite includes an indulgent bathtub. There are two more king-sized bedrooms based on this floor also. 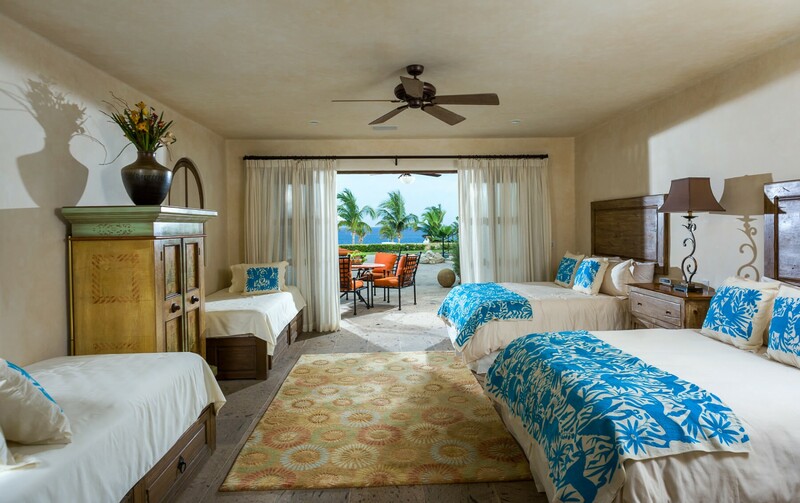 The bedrooms feature access onto the terrace with beautiful ocean views. 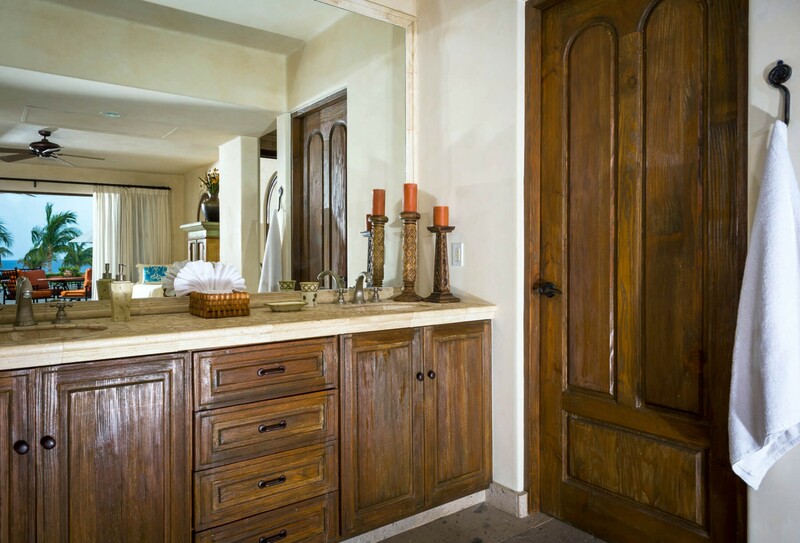 They include high-resolution TV’s, DVD players, and in-room safes, while the bathrooms offer large showers. 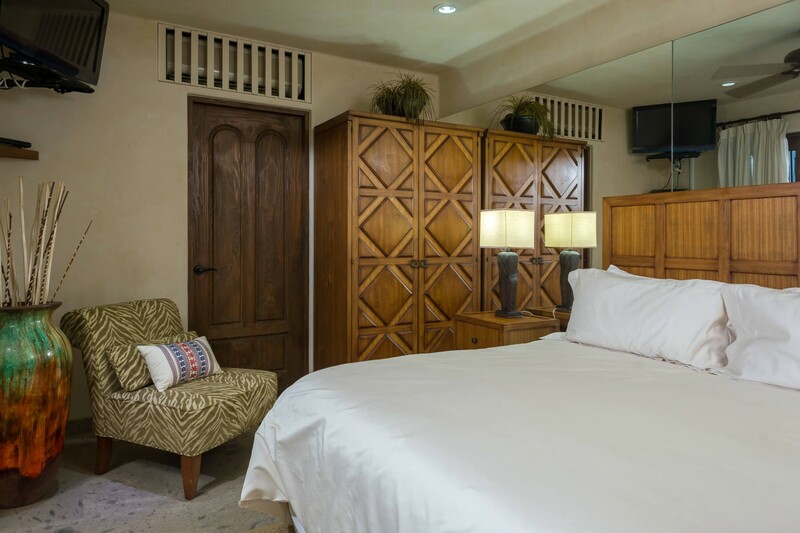 The two remaining guest bedrooms feature two queen-sized beds each, one of which also includes twin beds. These large bedrooms offer in-room safes and en-suite with showers. 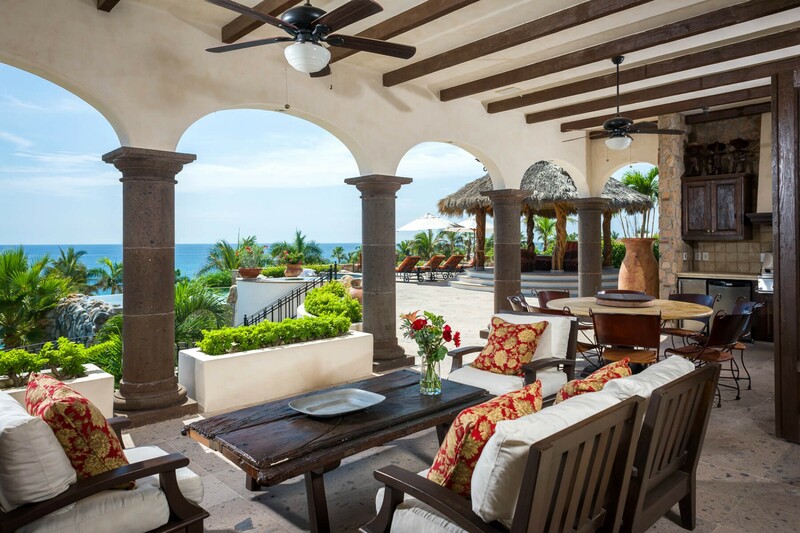 No matter where you are in Casa Alegria, indulge in the vibrant Mexican lifestyle overlooking the Cortez. 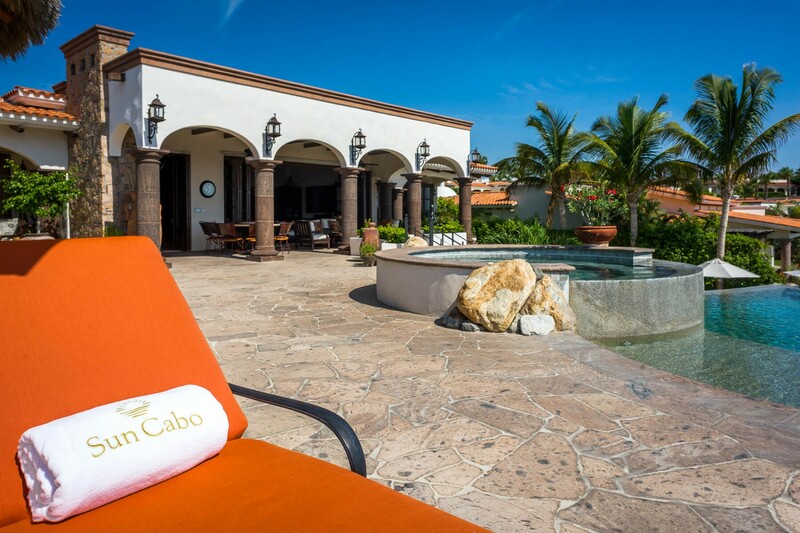 Relax into the comfort of your own private villa on the coast. 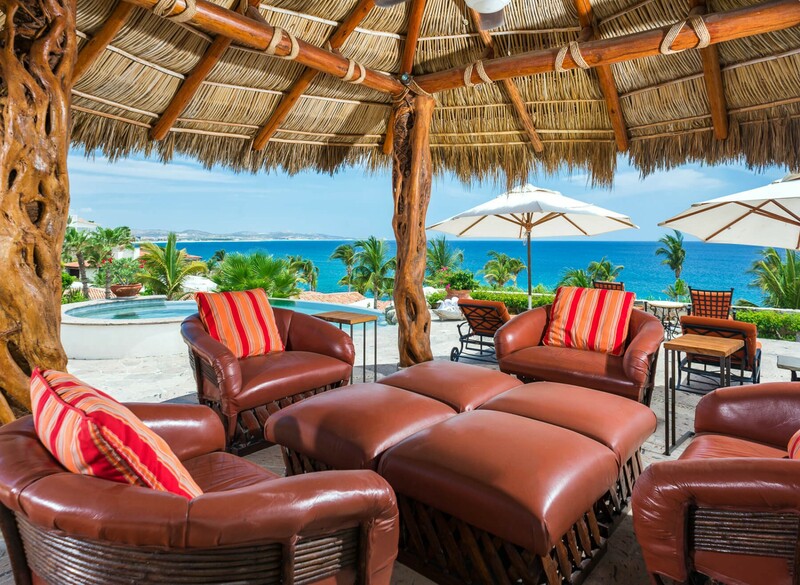 This serene, oceanfront setting allows for panoramic views and a once in a lifetime experience for you and your loved ones. Bedroom 1 Master: Luxurious King-sized Bed, Private En-suite Bathroom, Shower, Large bathtub, Hairdryer, High-resolution TV, DVD Player, Stereo System, In Room Safe, Panoramic Ocean View. Bedroom 2: Luxurious King-sized Bed, Private En-suite Bathroom, Shower, Hairdryer, High-resolution TV, DVD Player, Stereo System, In Room Safe, Panoramic Ocean View. Bedroom 3: Two Lavish Queen-sized Beds, Two twin beds, Private En-suite Bathroom, Shower, Hairdryer, Stereo System, In Room Safe. Bedroom 4: Two Lavish Queen-sized Beds, Private En-suite Bathroom, Shower, Hairdryer, Stereo System, In Room Safe. Bedroom 5: Luxurious King-sized Bed, Private En-suite Bathroom, Shower, Hairdryer, High-resolution TV, DVD Player, Stereo System, In Room Safe. 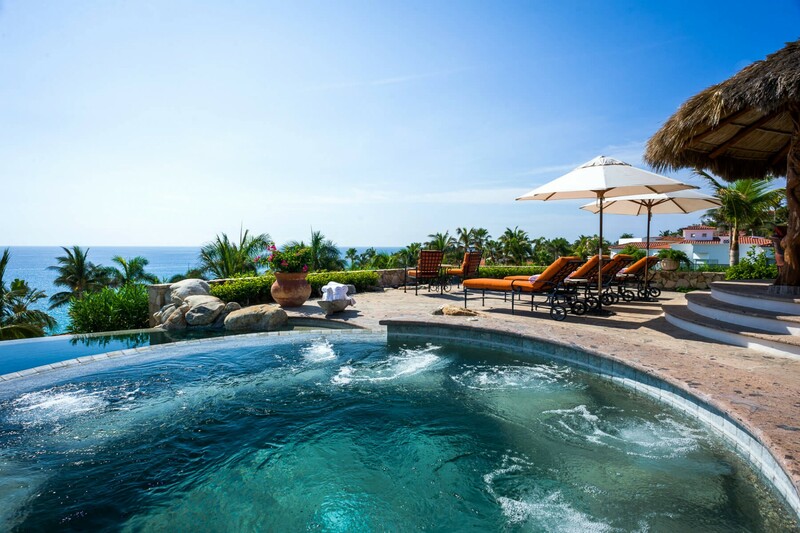 Casa Alegria is nestled overlooking the dazzling waters of the Cortez in Los Cabos, Mexico. 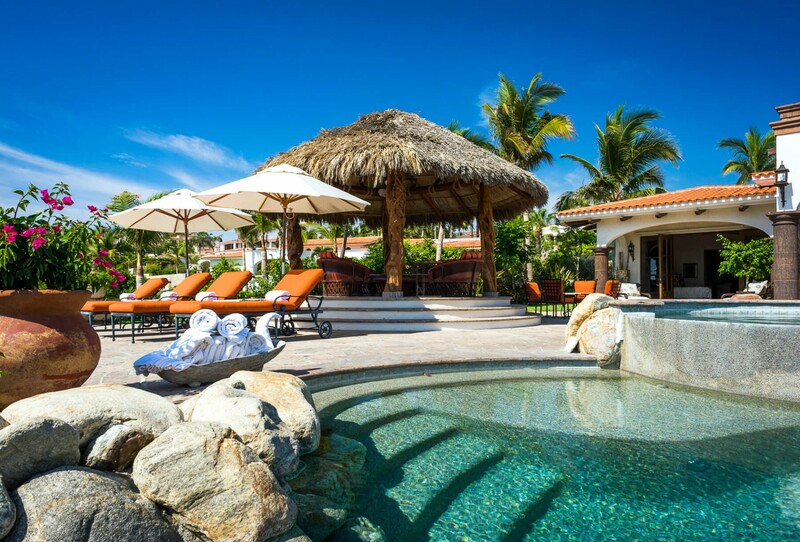 The property is part of the elegant and sought after Palmilla Resort and hotel. 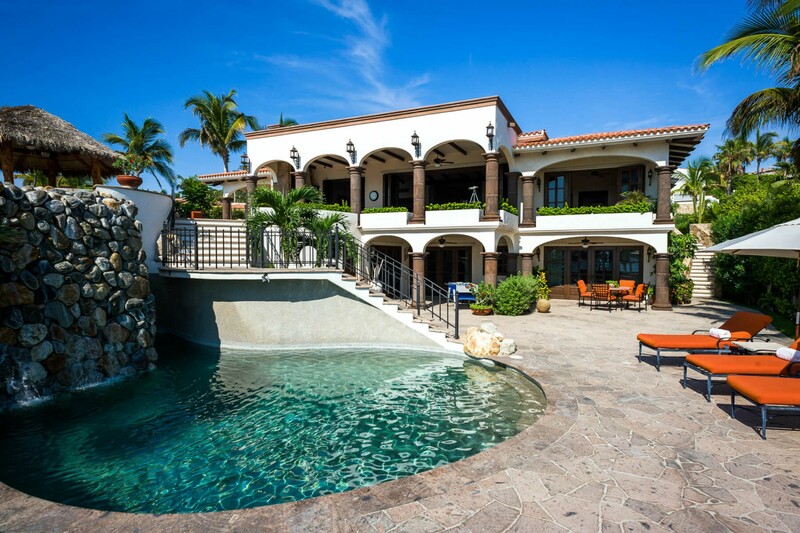 Based specifically in the ultra-exclusive Caleta community, this gated area provides an abundance of privacy and seclusion from the outside world. 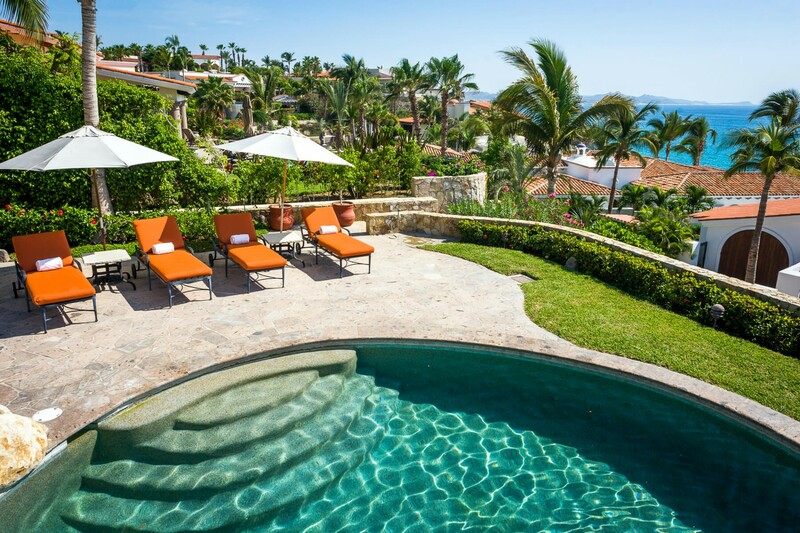 Los Cabos encompasses the two towns of Cabo San Lucas and San José del Cabo. 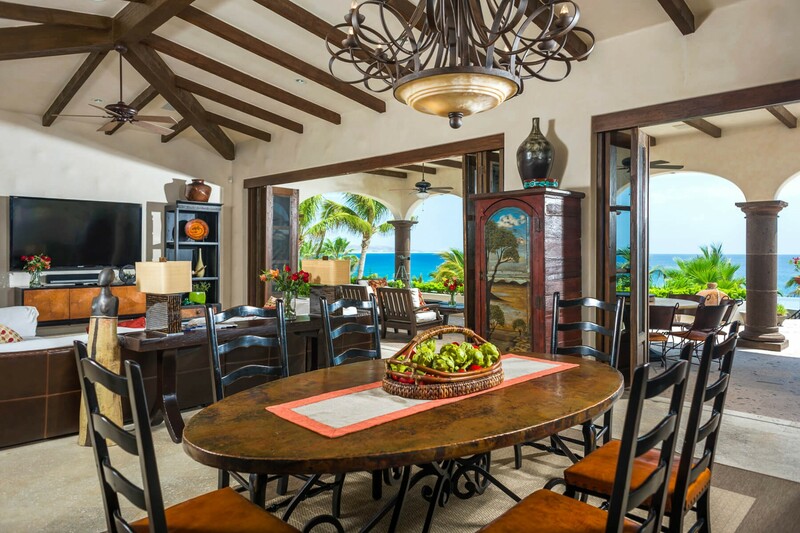 The areas are connected by the twenty-mile Resort Corrido, laced in luxurious, private beach-front properties and championship golf courses. 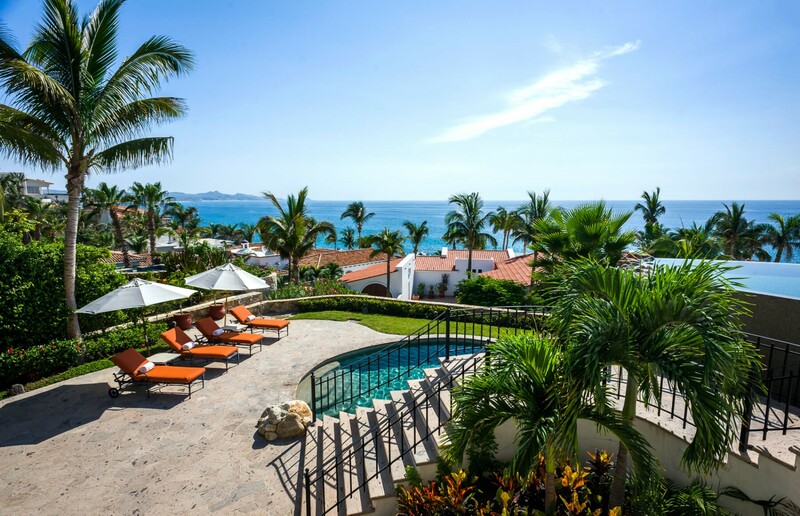 One&Only; Palmilla is based along this prestigious coastline, at the edge of the Baja Peninsula. 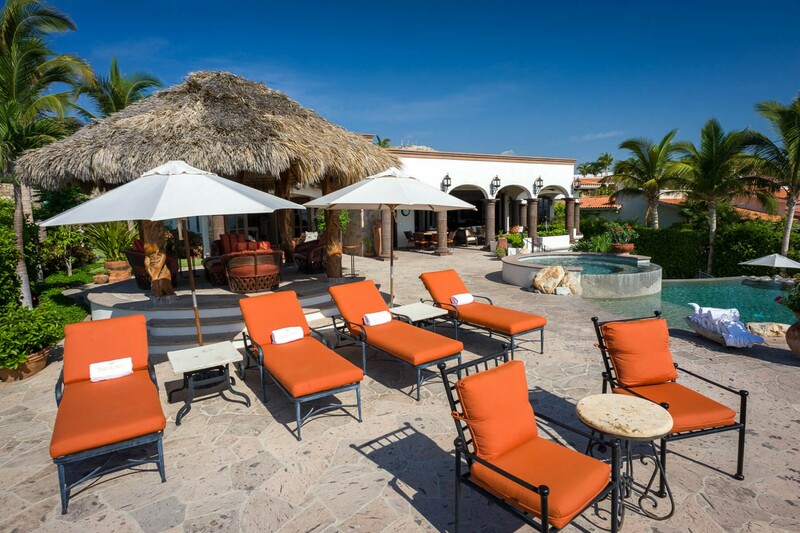 Surrounded natural golden desert sands, the resort enjoys access to the white sand beach and the breathtaking turquoise waters over the Sea of Cortez.